The Nobel Prizes are important and all. But if you’ve been paying attention to physics for the past two years, this year’s prize is akin to saying “my beautiful dog has won the Good Boy prize.” We’re very excited, but we aren’t surprised. These waves have a long story behind them. Back in 1915, Albert Einstein published his famous theory of general relativity, the one that says that massive things can distort the shape of space itself. He, and others, proposed that the force of gravity itself should be able to ripple through space, changing its shape like as it traveled like a wave through a pond . Einstein later came to doubt the existence of gravitational waves, but another physicist spotted an error in his work. By the 1950s, even before theorists accepted the existence of the waves’ most apparent sources (black holes), scientists had proven mathematically that these gravitational waves should be out there, according to the Nobel committee’s Scientific Background statement. Tantalizing hints followed. In 1969, Joseph Weber from University of Maryland claimed a discovery in a small detector, a bar floating on liquid with special crystals meant to convert vibrational energy to electricity. But similar experiments in the 1970s couldn’t recreate the results. If scientists wanted to prove the existence of the waves, they’d need to go bigger, and build something more sensitive. Thorne and Weiss were dedicated to finding the waves, and designed a new detector. After some bureaucratic and planning hiccups, it was Barish who saw the construction to its completion. This resulted in a pair of several-kilometer-long, L-shaped experiments called the Laser Interferometer Gravitational Wave Observatories in Louisiana and Washington State, that cost the United States’ National Science Foundation several hundreds of millions of dollars. These detectors consist of a laser beam split down each pipe’s length, bouncing off mirrors and returning to a single spot where their light waves cancel each other out. A gravitational wave should make the beams vibrate in and out of phase with each other the tiniest amount, creating a little bit of light that shines into a new detector. Then, on Sept. 14, 2015, almost immediately after a major upgrade, ripples from a pair of colliding black holes 29 and 36 times the mass of our own Sun 1.3 billion light years away arrived on planet Earth, showing up as a tiny vibrations in the data, with an amplitude far smaller than an atom. The team announced their discovery on February 11, 2016. It was very exciting and we clapped a lot. 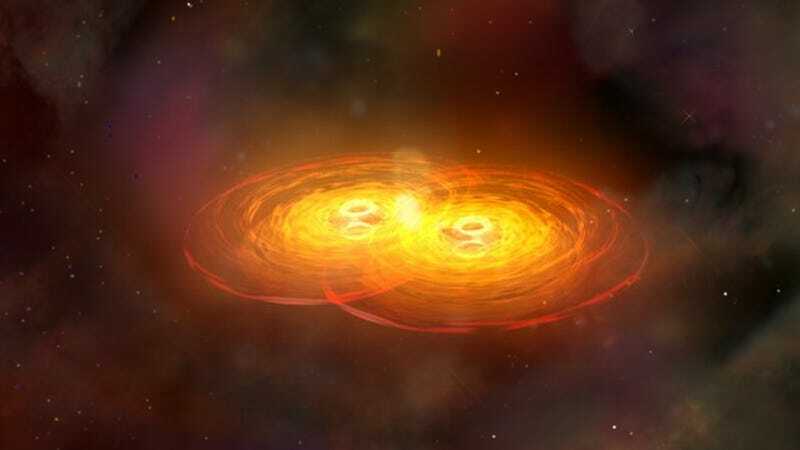 This might sound like the end of the story, but is in fact the beginning; since then, several more waves have been detected from other pairs of colliding black holes, and a third detector sensitive enough to spot the waves called Virgo has joined the mix. Lots of physicists are dreaming up new ways to use the detectors to discover more exotic things like the elusive dark matter or tobetter understand black holes. Rumors are swelling about potential new sources of gravitational waves that might also come with corresponding light waves that more traditional telescopes can spot. In the current era, some scientists are re-thinking how the Physics prize is awarded. The Royal Swedish Academy can only award the Nobel Prize in Physics to a maximum three people, but some experiments often feature a thousand physicists working hard to keep the science happening. And rather than single discoveries, there is often lots of incremental work that eventually sums into a larger understanding of the universe, Princeton physicist Shivaji Sondhi and Stanford physicist Steven Kivelson wrote in an editorial published recently in Nature Physics. They propose offering the prize to more people simultaneously, identifying the most important scientists to a given effort, or even creating a prize that instead rewards scientists for cumulative lifetime achievement. Last year, Science magazine guessed Weiss and Thorne would win, and lamented that Barish might not receive the reward. Now that LIGO has received their award, the real question is: What will they discover next?